America has watched the Duggar girls do laundry, pack and unpack their suitcases, go on field trips, homeschool the little ones, and travel the world... all with 19 kids in tow! This mega-sized family has captured the hearts (and peaked the interest) of thousands of viewers on their hit TLC show, 19 Kids and Counting. Jana, Jill, Jessa and Jinger. Growing up in the public eye where everyday life is captured by cameras, isn't an easy feat...but the Duggar girls have carried themselves with grace, humility, and a healthy dose of humor, amidst all the craziness! 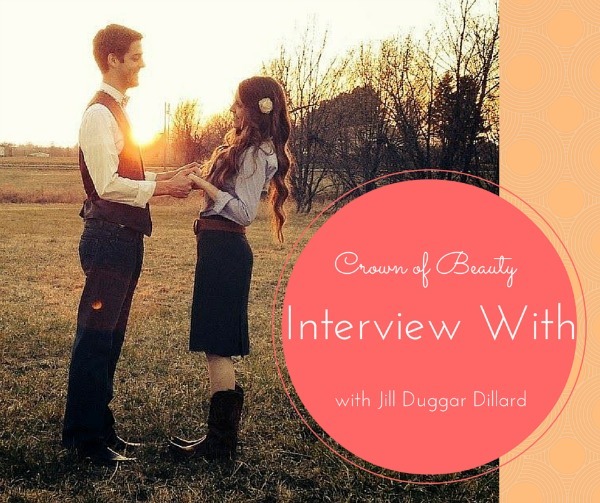 I (Livy) was blessed to sit down and chat with the Duggar ladies via Skype, and ask what it's really like Growing Up Duggar. We kicked off the interview by asking the sisters to describe one another! Jill said, "I'll start with Jana. Jana is 24, and she is the oldest of the girls. She's kind of a quiet personality whenever she's around other people. At home she'll talk more, but she's kinda more quiet and reserved. And yet she can get a lot accomplished pretty fast, like she's got that first-born tendency to be able to organize the troops when she needs to! So that's Jana." Jana went on to describe Jill, "Jill. She is our fourth born. She is very fun loving and caring, and wants to disciple young ladies. She's always holding babies, she's a student midwife right now, so she is hopefully going to get her midwifery license within the next year or two. She's the one who helps with a lot of things around the house, she has a number of things that she does. Number one, helping with the music when we go and sing and play at different places for different events. She's the one who helps us get it all together, and makes sure we sound good. Jill is a lot of fun!" Jinger said, "I'll describe Jessa. She is a very organized person, so she keeps our house free from clutter. She is really good at playing guitar. She's done some prison ministry, she and I just got back from prisons in Florida, and so that was really, really exciting, just ministering to the inmates there. So she has a heart for reaching out to younger girls and really just coming alongside them, and ministering to them." The Duggar girls are asked a lot of questions. “What's it like growing up with so many siblings? Why have you chosen not to frivolously date every cute guy you meet? After being asked these questions too many times to count, the Duggar girls decided to tackle these questions with the most direct way to answer...a book! Jessa explained, “We wanted to write the book because we received lots of e-mails from young girls, mostly teenage girls and sometimes parents, just asking questions about our life, growing up, our family, etc. We also wanted to share more stories and let people know that we're real. People sometimes look at our family and say, 'Well you just don't have the same challenges and struggles that we do.' Sometimes they think we're perfect or something! But we're not. So we wanted to let people know... just think of the challenges you have in a family of two or three, then multiply that about ten times over! We have sibling quarrels and times we don't get along, but what we wanted to do was share some of those stories and share the principles we've found from the Bible, that have helped us work those things out, and keep our family relationships strong. Since our upcoming May/June issue is all about dreams, I had to ask..."Was writing this book a dream that any of you had as little girls?" Jill added, “Yeah, and having come out of our teen years, we felt like this was a perfect time to be able to encourage other young ladies (parents too, but especially young ladies) as they are in their teen years, and struggling with all the different relationships. We're wanting to encourage them." relationships. They wrote about the many facets and intricate details of each kind of relationship. Such as, your relationship with God, relationship with siblings, friends, family, etc. One topic that really caught my attention was, “Relationship With Yourself.” It's not often a girl thinks about being friends with...herself! But the Duggar girls had a lot of wisdom to share when it comes to this topic. Jessa said, “This [topic] is the first chapter, and we weren't trying to write this chapter by saying, 'Look within yourself, have self esteem, respect yourself, etc. ', but really taking it from the perspective of accepting the way that God made you. So we talk about the ten unchangeable things in life: where God has placed you, who your family is, who your parents are, siblings, your birth order, your nationality, your gender, and physical features, etc...accepting all these things about the way that God has created you, as His unique, special person. Or just these feelings of 'you're ugly,' or whatever it may be, are lies the devil really throws at you, and so we talk about how we've been able to overcome those things in our lives by going to God's Word and what He says about us. And He didn't mess up. We're not a mistake, none of our physical features, none of our design is a mistake. Click on cover above to open. May take a moment to load. Enter a world of heroic knights, castle walls, princess skirts, and pixie dust! This FREE, 60-page issue includes full articles and interviews! 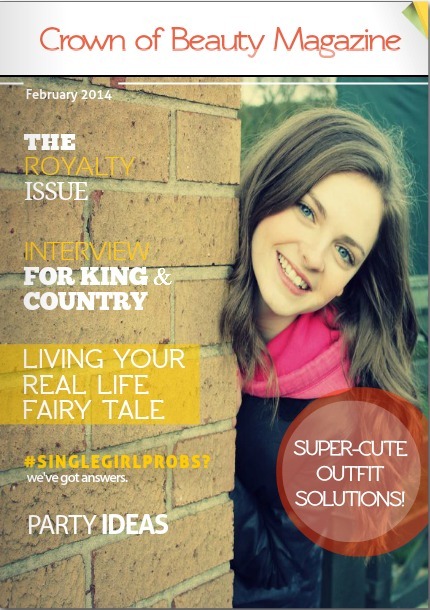 Our premier magazine release is jam-packed and full of spectacular content! 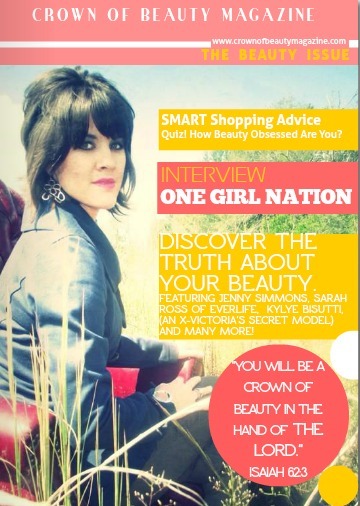 Every article, interview, quiz, and fashion feature revolves around one topic...true beauty.